Kayaking the Na Pali Coast is truly an awesome summer adventure, but this is a very demanding trip and it is not for everyone. 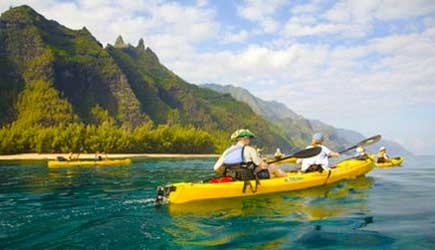 You begin your 17 mile paddle in Hanalei and end your day at Polihale beach. As you kayak along the coast, you will marvel at sea caves, plunging waterfalls, hanging valleys, and secluded beaches. Along the way it is common to encounter dolphins, sea turtles, and on special occasions you’ll catch a glimpse of the elusive Hawaiian monk seal. This is an EPIC day for those who are up to the challenge! The Na Pali sunset cruise is perfect for those who are more interested in the scenery of the coast rather than the snorkeling. 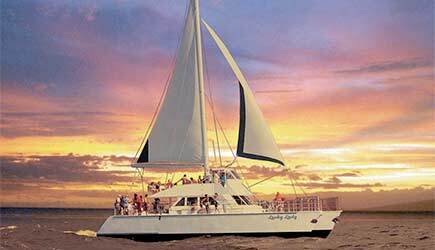 You will experience a Kauai sunset on board Holoholo’s 65′ power catamaran. On board you will enjoy a scrumptious light meal, soft drinks, beer, wine and champagne at sunset. As you gaze upon the majestic cliffs, the crew will entertain you with stories of the Hawaiians who once lived in these remote lands. 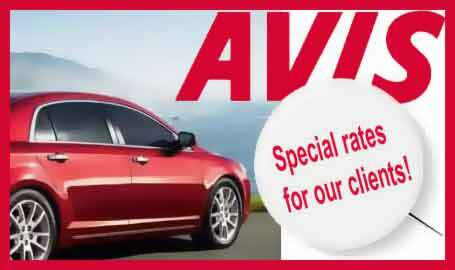 The dramatic cliffs, green valleys, hidden beaches, and secluded waterfalls will take your breath away. 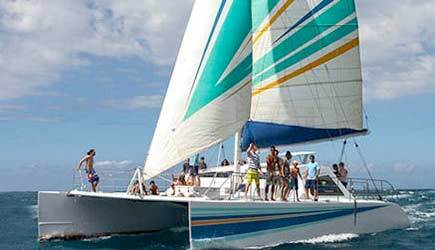 On the Poipu Sunset Sail, departs from historical Port Allen for an evening of aloha aboard their beautiful 50’ Sailing Catamaran. You will experience the lifestyle of aloha with true trade-wind sailing along Kauai’s sunny south shore coastline. You may witness secluded beaches, sightings of Hawaii’s friendly marine life, seasonal migrating whales, colorful rainbows and a gorgeous Poipu sunset. Poipu Sunset Sail typically visits the historic South Side of Kauai, and it does NOT visit the Napali Coast. On the NaPali Dinner and Snorkel Cruise, travel along Kauai’s spectacular coastline when the afternoon light adds a special magic. Encounter pods of playful dolphins playfully skimming the waters at the bows and curious sea turtles. The Captain will pick a suitable site for a swim and snorkel stop. Feel free to dive right in or take the convenient stairs into the water. A zip down the water slide is great fun for all ages and the swim platform an excellent resting or cooling off. 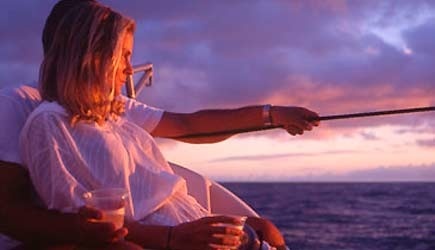 After you experience the thrill of snorkeling, indulge in the romance of a Hawaiian sunset cruise. At Poipu beach, you can learn how to surf with the instructors of Aloha Surf Lessons. The first part of the lesson happens on dry land where you will learn how to position yourself on the board, how to stand up, and the correct posture to adopt while riding the wave. Then it’s just a few steps out to the beach where you’ll paddle out and start your in-water lesson. Due to the sandy bottom and consistent surf break for beginngers, Poipu beach is a great place to learn. Instructors help you into position to wait for a wave, and give you a little push to assist you in take-off. They will continue to give you insight into improving between each wave. 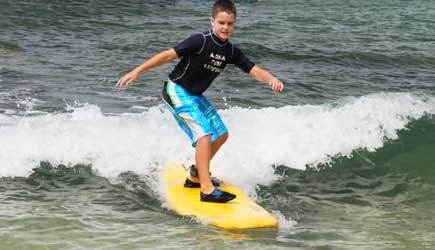 The professionals of Hawaiian Surfing Adventures will teach you how to surf at Hanalei Bay. The lessons last for 1.5 hours followed by an extra hour of practice on your own. The first 30 minutes or so is spent watching the ocean, taking about ocean safety, and teaching proper positioning on the board. After you’ve learned how to stand up on the board on on land, you’ll paddle out to the surf break and apply your newly learned skills. Instructors will help you catch a wave and give further insight and instruction while out in the water for the next hour. There is no more scenic place to take a surf lesson anywhere in the world than Hanalei Bay! This exteremly popular activity was an ancient Hawaiian sport, and Jungle SUP Adventures offers a central Kauai SUP experience on a jungle stream and includes hiking and a unique and fun water zipline. This tour combines SUP lessons, paddling downwind on a placid jungle stream, hiking, and water fun at the Blue Pool, home to a fun jumping/diving platform and an insanely fun water zip line! You will paddle upstream with the trade winds at your back, and at the end of the tour you’ll be transported back down the river via a relaxing motorized double hulled canoe. 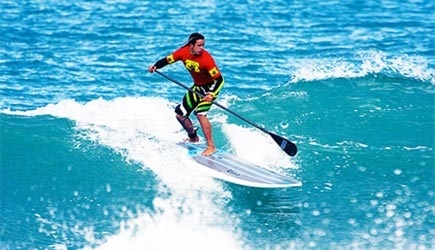 Stand Up Paddleboarding (SUP) is an ancient Hawaiian sport that has become popular once again, and Kauai offers the unique opportunity to practice this sport both in the ocean and on calm inland streams. 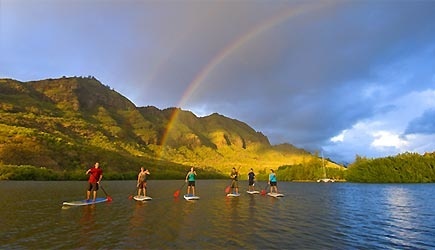 This Hanalei SUP lessons is on the north shore where you can paddle up the river and out into Hanalei Bay. SUP is a really fun way to experience the water, and it is not difficult because these guys will match you up to a board that is just the right size for you. 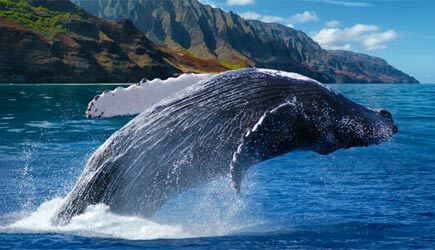 If you are visiting Kauai in the winter months, a whale watching tour is a must see. Humpback whales migrate to the islands to have their babies, and they enjoy playing and teaching their young how to breach. Na Pali Explorer’s vessels provide a fast, smooth, and adventurous ride in a variety of ocean conditions. You will have an intimate and adventurous experience with these amazing animals, and it is not uncommon for whales and dolphins to swim and play along side of the boats.